The Japanese cards of the day for April 24th, 2018 are Damanance Dragon and Savage Hellfire Gabiya, a pair of Kagerо̄ commons from V-Booster Set 01: UNITE! TEAM Q4. Both of these units are grade 1 attackers that gain power based on the Kagerо̄ deck doing Kagerо̄ things: retiring the opponent's rearguards to disrupt the opponent's field and make aggressive plays. 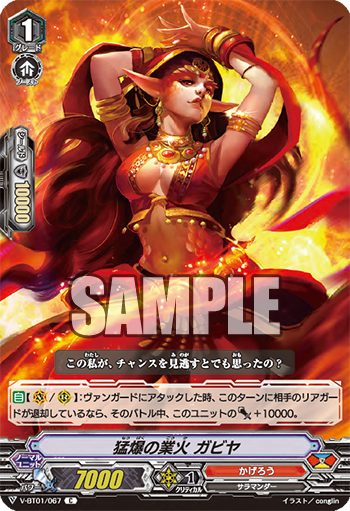 Gabiya's condition is arguably easier to fulfill later in the game with the introduction of cheap retires from Nehalem, Berserk Dragon, and Bahr; with the latter active she makes a 28k column for one turn, then reverts to just 25 after that. 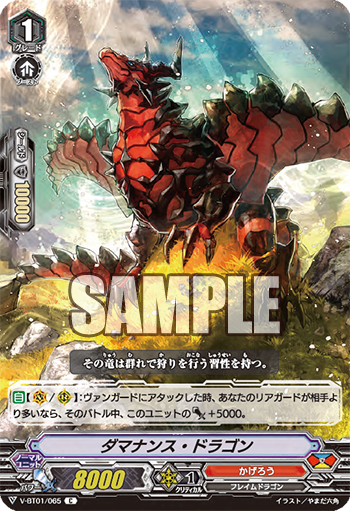 Gabiya also doesn't specify "main phase" like Joka or Chain-attack Sutherland from years past, so if you retire an opponent's rearguard by attacking it with Dragonic Overlord that will also meet her condition. Both units being active on vanguard and rearguard sets them apart from the more generic attackers like Anil. Damanance will be easier to get off in the early game rather the late, but so long as you maintain a full board and can successfully retire one unit he'll remain active. While he only swings for 13k, his higher base power makes him a more effective back row booster than Gabiya and he still makes a 23k column when boosted by Gojo. That's functionally the same cap with every booster but Bahr, as Gabiya only makes a 27 with Gojo which is functionally identical to 23k. ...That leaves 2~3 more slots to fill. Pending further reveals, Damanance is the easiest to fit in that space, as he requires comparatively little commitment each turn compared to Gabiya. It is worth keeping mind that Lizard Soldier Raopia is going to feature in the set as a card of comparative importance to Pongal, and its skill is likely to push one of these two out of the deck. The previous Japanese cards of the day were Sage of Literary and Military Arts Jarron, and Auspice Falcon.